Everything old is new again. I always think of that saying when I see the successful outcome of one of our renovation projects. Here’s a look at how we transformed these apartments and what made this renovation project so unique. Young people want a stylish place to live in a cool part of town like Midtown. That’s something we’re aiming to provide with renovations like the ones we did on the McLean Apartments and this South Idlewild house (which was named a Building Memphis finalist)—and the Brinkley Apartments definitely deliver on that front too! The Brinkley Apartments are situated in beautiful Overton Park, right across the street from Ecco, an awesome restaurant that serves up delicious Mediterranean home cooking, and Diane’s Gifts, a unique little art shop. The apartments are also only a short distance from Overton Square and all the great food, shopping, and fun that area has to offer. One of our goals with the renovation of these apartments was to capture the modern vibe of Midtown while also tipping our hats to the rich history of the neighborhood. Our design theme for Brinkley Apartments was a balance of modern convenience with a historic aesthetic. The apartments got a facelift, but we retained their authentic, old-school charm. Our goal was to make the kitchen both more aesthetically appealing and increase its functionality. To accomplish this, we removed the wall between the kitchen and the dining area for a more open concept. We also installed granite countertops and new stainless steel appliances. All appliances were brought in new to cut down on maintenance, providing renters an overall better living experience. Our tenants have told us how much they enjoy stacked washers and dryers in convenient, yet unobtrusive spots. This nook was the perfect, accessible place for laundry appliances that doesn’t eat up a lot of space. If you are a Midtown dweller or have hunted for a home in the area, you probably know the pain of finding a great place that still has window air conditioning units! Central air is a necessity to our tenants that we made sure to invest in. Sure enough, one renter pointed out that this was one of the things that won her over when viewing these apartments! Along with having all the conveniences of modern living, renters want a place that feels custom and unique. In all our renovations, we try to incorporate high-end elements to create the feeling of not just a cookie cutter apartment, but a thoughtfully designed home. In this case, details like custom shelving in the dining area, the barn door in the bedroom, Jacuzzi tubs, and GFI outlets took the apartments to the next level. This is one of my favorite features of these apartments. We added retractable windows to the bricked-in porch area to maximize usability and give renters an indoor/outdoor feel. You can open the windows up on a beautiful day and get some fresh air, or close them on a chilly day so you can still use the space. This project has become a new favorite of mine! We love designing these spaces to anticipate our renters’ every desire. 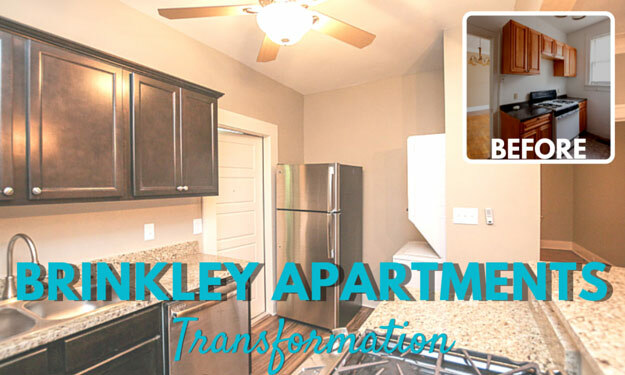 Want to see more of our renovated Brinkley Apartments in Midtown Memphis? Watch the walkthrough video below or take this cool 3D Visual Tour from your desktop or mobile device! Ryan Edwards is the owner and property manager for EZR Management. He founded the company in 2006, building on his years of experience managing and renting properties.